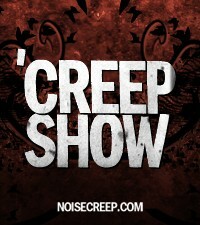 Although we didn't schedule 3 Inches of Blood on ''Creep Show' with the expectation that they would be especially relevant to the week's news, the powers that be made their appearance as timely as today's headlines. During the show, vocalist Cam Pipes and guitarist Shane Clark made some of their most heartfelt and poignant comments to date about the recent death of former bassist Brian Redman, who was killed in a motor vehicle accident in Tacoma, Wash. on September 27 at age 31.The guys didn't just offer the usual condolences, they reminisced about the good times they had with Redman and told stories about their adventures. They also talked about the tragic passing of Evile bassist Mike Alexander, whom they had recently partied with on tour. Fortunately, the 3 Inches of Blood appearance wasn't all doom and gloom. The two Canadians joked around about Linkin Park frontman Chester Bennington's side project, Dead by Sunrise, gushed about the more traditional metal direction they took with their new album 'Here Waits Thy Doom,' explained why they're better off with one singer instead of two and discussed the influence of Canadian metal bands like Voivod, Exciter and Anvil. Joining Pipes and Clark on the program were AOL Noisecreep editor Seth Werkheiser, Revolver senior writer and Noisecreep contributor Jon Wiederhorn and Noisecreep news man Chris Harris. In addition to news of the tragic, the panel addressed news of the weird, including Ozzy Osbourne's announcement that he was once incorrectly diagnosed with AIDS and original Kiss drummer Peter Criss admitting that he was diagnosed with breast cancer in 1988, but is now cancer free.